Sometimes, I have to make art just so I can put it on a card in my Etsy shop, and this is one of those times. I’m trying to expand my offerings over there to something that isn’t quite so holiday-dependent. Thus we have a gender-free, geek-positive baby cards. 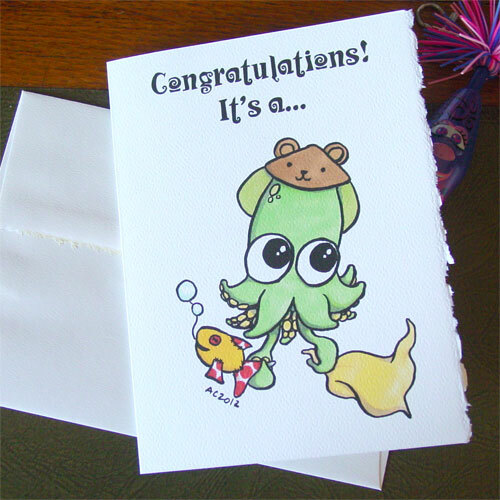 I actually made two versions of this one: one is blank with just the image, and the other says, “Congratulations, it’s a…” on the front, and on the inside finishes with “Well, Congratulations, anyway.” Yes, I can even be sarcastic in the face of those giant soulful eyes. I did have fun trying to make the cutest widdle squiddy you ever did see, though. 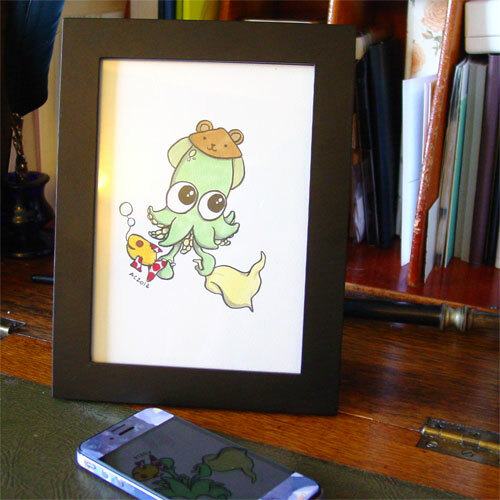 The original would be awesome in a baby’s room somewhere, trying to out-cute the offspring. Baby Squid, 5″x7″ pen & ink and Copic markers on paper. Above I have him put into a frame so you can imagine how it would look. Below, you can see what he looks like on the snarky version of the card. 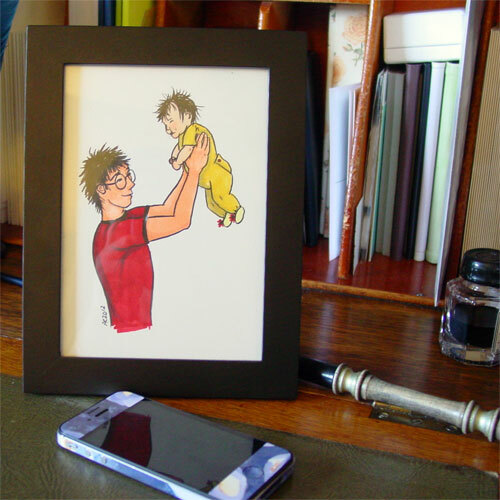 Is it James Potter and little Harry, or grown-up Harry and little James Sirius? In my mind it’s a little of both, James and Harry sharing a moment of fatherly love from one generation to the next. 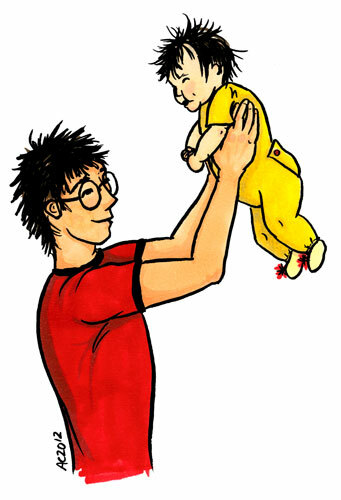 I even gave them Gryffindor-themed colors, with warm baby yellow and bright fatherly red. I have to admit, my favorite part about drawing Harry Potter is the hair, which is always a fun, scribbly mess. Baby hair is just a little different, wispier and more staticky while being just as much of a mess as dad’s infamous mop. 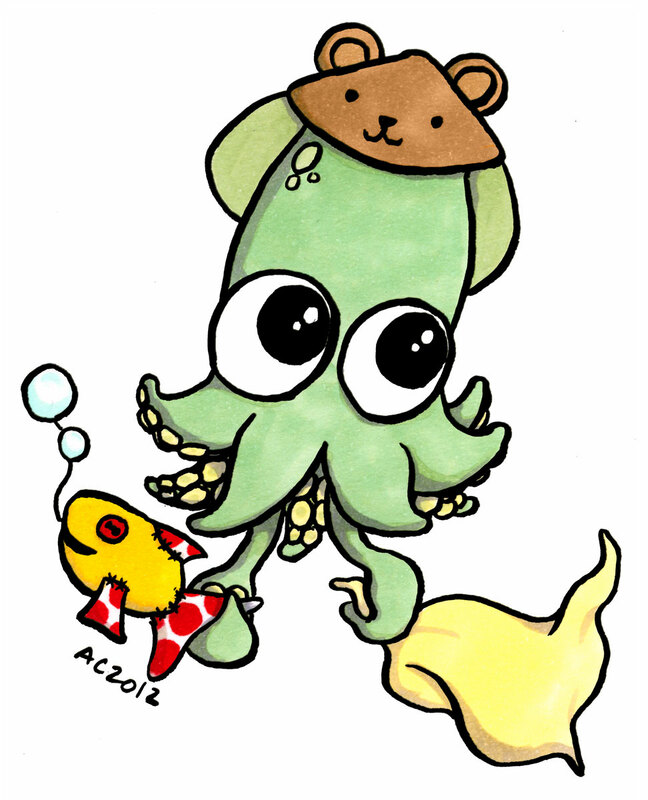 Potterly Love, 5″x7″ pen and ink and Copic markers on paper.